Nucleic acid visualization with UCSF Chimera. Couch GS, Hendrix DK, Ferrin TE. Nucleic Acids Res. 2006 Feb 14;34(4):e29. Ring fill thickness tracks the thickness of the surrounding bonds: a thin layer for wires, thicker for sticks. The thickness of sticks and of tube sugars can be adjusted by changing the stick scale (a molecule model attribute). Show base orientation (true/false) - show the positive faces of bases with bumps. The positive faces are those which point towards the 3' end of a strand in right-handed A- and B-DNA (the positive Z direction in the standard reference frame). The bumps will be displayed for bases shown as slabs or with thick fill, but not where the fill is a thin layer. Clicking NDB Colors sets atom and ribbon colors according to the convention used in the Nucleic Acid Database (NDB): A red, T blue, C yellow, G green, and U cyan. Special nucleotide representations will be created only where the corresponding atoms are displayed, and will be colored to match the atoms. OK updates the display and dismisses the dialog; Apply updates the display without dismissing the dialog. The option Restrict OK/Apply... limits any changes (including setting NDB Colors) to nucleotide residues in the current selection. Close dismisses the dialog, and Help opens this manual page in a browser window. 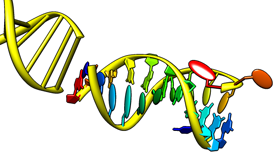 Nucleotide displays other than atoms, bonds, and ribbons are opened as a VRML model with the same model number as the corresponding molecule model. These models can be closed or hidden with the Model Panel, or undisplayed/displayed (hidden/shown) with the command objdisplay. Separate glycosidic bond (true/false) - whether tube sugar representations should each consist of a single straight segment (default) or two segments, one along the glycosidic (sugar-base) bond; applies only to tube / slab display with base-anchored slab styles (long, skinny). A slab style refers to the slab dimensions and location relative to the atoms in purine and pyrimidine bases. The settings define a virtual rectangle in the plane of the base, as shown in the schematic diagrams in the dialog. Ellipsoid slab objects will be drawn to enclose the the virtual rectangle. Changes in Slab Style settings will be shown in the schematics, but will not affect the Chimera display until either Apply or OK is clicked. Custom slab styles are saved in the Chimera preferences file, and are only updated with any changes when Save, Save As... or Delete is used. A standard reference frame for the description of nucleic acid base-pair geometry. Olson WK, Bansal M, Burley SK, Dickerson RE, Gerstein M, Harvey SC, Heinemann U, Lu XJ, Neidle S, Shakked Z, Sklenar H, Suzuki M, Tung CS, Westhof E, Wolberger C, Berman HM. J Mol Biol. 2001 Oct 12;313(1):229-37. Rung radius (default 0.45 Å) - radius to use for ladder rungs showing H-bonds between bases, and for stubs representing bases that lack H-bonds to other bases. When the Skip... option is false, any H-bonds involving non-base atoms (on either or both ends) will be shown with a smaller radius corresponding to the smallest ribbon dimension, or if the backbone is not shown as a ribbon, the model stick size. Use existing H-bonds (true/false) - whether to use H-bonds previously calculated with FindHBond (or the command findhbond) instead of running a new calculation. If this option is true and a pseudobond group named hydrogen bonds exists, another H-bond calculation will not be performed (even if the H-bonds are for some other structure). Relax H-bond constraints (on by default) - whether to relax the strict geometric criteria for identifying H-bonds. The default relaxation amounts are 0.4 Å and 20.0°. After showing these modified bases as slabs, it may be necessary to undisplay extra base atoms that were not hidden automatically.